Bob…I’ve got something in my eye. “Don’t worry…I can help you get it out! 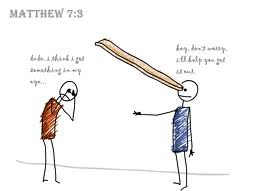 Mathew 7:3-5 Why do you look at the speck of sawdust in your brother’s eye and pay no attention to the plank in your own eye? 4 How can you say to your brother, ‘Let me take the speck out of your eye,’ when all the time there is a plank in your own eye? 5 You hypocrite, first take the plank out of your own eye, and then you will see clearly to remove the speck from your brother’s eye. My blog today is a testimony about how God broke me out of a bad habit of minding other people’s business. Earlier in my Christian walk I did not always stop people when they were talking about other people to me because … “we’re praying for them”. Even before I became a committed Christian…I was what you call a nosey person. I had opinions about other people’s business. So after some years of walking with the Lord I heard a awful rumor about a Christian in my community that happened years before. One day I was at a church service and this person was there. I could not pay attention to the service because I was too busy thinking about the rumor. It consumed me to the point that I cried out to the Lord and asked Him to help me. I will NEVER forget what the Lord said to me….”while you’re looking at Him, I’m look at you…While you are judging there heart….I’m judging yours! This immediately got my thoughts under control and has continued to do so to this day. I love God’s lessons….they will fix you right up. You betta believe I mind my own business now except when I’m on assignment for the Lord and He ask me to attend to someone. I have also learned that God does check out my heart, my motives, and my thoughts. I want Him to…I want to be clean inside. It’s just that I feel uncomfortable now if I gaze at someone else’s stuff…because I always know His eyes are on my stuff. In the scripture above it says there is a speck in your brother’s eye and a whole big plank, log…tree in the judger’s eye. I think that person may have some kind of sin in their life…but I think God’s view on the person judging the other person as a bigger issue. God is the only one who has the real authority to judge another person. God looks down to earth at me and puts His hands on His hips and says….Look at Tanya Nemley all up in Our business…she has no right to have her eyes on anyone else’s affairs. Is she exhibiting the fruits of the spirit or 1Corinthians 13:4-7 ? Let’s speak to her about this…I know she will listen because I know how much she loves us and wants to obey my word. Well it looks like she got the message…Have you read her blog today? Message for today: Mind your business before God gets into yours. God has taught me many lessons and here is one of them…ouch! Amen, Tanya! And what a good reminder this is, especially for office workers, neighbors, ALL of us! Excellent words for today. Paul shared with those in Rome, “In judging others, you bring condemnation on yourself. Why? Because your guilty of the same things you judge others of (2:1).” We all stand fully in the grace of Jesus, or we do not stand. I love the statement, “While your looking at them, I’m looking at you.” What a thought to ever keep in sight! Thanks for the wonderful words. I tell you…when God told me that I was like…alrighty now!…I don’t think I’ll ever forget that…and i haven’t. That statment sent chills up my spine. Thank you for stopping by my blog and…..God bless you real good!